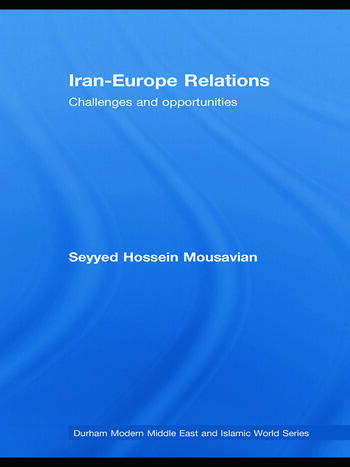 This book provides an assessment of relations between Iran and Europe, identifying the areas of common interest as well as the issues of conflict, whilst putting contemporary relations into their proper context with an account of their development since the early years of the twentieth century. Written by a former diplomat who served as the first Iranian ambassador to post-reunification Germany, this book shows that despite the recent deterioration of relations between Iran and the West, Iran has enjoyed a long history of cultural, economic and political ties with many European nations such as Germany. The book explores important historical episodes, including Iran’s support of Germany in the years before the First World War; the burgeoning economic, commercial and scientific co-operation in the interwar years such that by the start of the Second World War Germany was Iran’s leading trade partner; the impact of the Islamic Revolution in 1979; and the attempts by the administration of President Rafsanjani to strengthen ties with Europe in the aftermath of the Iran-Iraq War. Iran-Europe Relations goes on to examine in detail the recent issues of conflict between Iran and Europe: disputes over weapons of mass destruction; allegations of Iranian support for terrorist groups in Afghanistan, Bosnia, Iraq and Lebanon; disagreements over human rights; the Arab-Israeli conflict and the Middle East peace process. It concludes by suggesting ways in which Iran-Europe relations can be encouraged to develop positively, overcome current obstacles and nourish the opportunities and common interests that lie beneath the surface. Dr Seyyed Hossein Mousavian is currently Vice President of the Centre For Strategic Studies, Tehran, Iran. He is also Foreign Policy Advisor to the Secretary of the Supreme National Security Council of Iran (SNSC). From 1990 to 1997 he served as Iranian Ambassador to Germany.